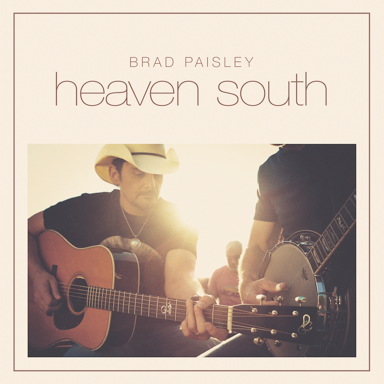 Country music superstar Brad Paisley has announced the next single from his chart-topping LOVE AND WAR album will be “Heaven South.” Written by Paisley, Brent Anderson and Chris DuBois, it is one of the 16 tracks on LOVE AND WAR, all of which Paisley co-wrote. The video for “Heaven South” was filmed in Franklin, TN earlier this year and captures the community spirit of a small town. From traveling the country roads in the back of a pick-up truck to an impromptu concert set up on town square – the residents of Franklin packed the streets. View the “Heaven South” video HERE. Paisley’s LOVE AND WAR album was released earlier this year and was his 9th consecutive studio album to debut #1 on Billboard’s Top Country Albums chart. It is the first ever country music visual album. For a limited time it was available exclusively on Apple Music but now is available in its entirety on VEVO. It can be viewed HERE. All 16 songs from the album flow seamlessly as a movie to tell the complete story. Locations of the video shoots ranged from a concert in a Sleep Number store in a mall, a party at Brad’s parent’s house to the USS Midway in San Diego, CA. Brad Paisley, Dave Brown, Derek Cressman, Frank Agnone, Jeff Venable, Jim Shea and Todd Cassetty were the directors involved. Producers included Ben Skipworth, Frank Agnone, Jim Shea, Kendal Marcy, Mark Kalbfeld and Todd Cassetty, and executive producer was Kendal Marcy. Brad Paisley is a critically acclaimed singer, songwriter, guitarist and entertainer whose talents have earned him numerous awards, including three GRAMMYs, two American Music Awards, 14 Academy of Country Music Awards and 14 Country Music Association Awards (including Entertainer of the Year), among many others. He has been a proud member of the Grand Ole Opry since 2001. Paisley has written 21 of his 24 #1 hits including his most recent smash, “Today.” The song has resonated with fans around the globe with the music video garnering over 43 million views, so far. “Heaven South” is his current single from his 11th studio album, LOVE AND WAR, which was released April 21. It is his 9th consecutive studio album to debut #1 on Billboard’s Top Country Albums chart. On April 28 LOVE AND WAR was released as country music’s first ever visual album for a limited time exclusively on Apple Music and now is available on VEVO. Paisley has contributed two instrumental tracks to the Disney·Pixar movie Cars 3, which hit theaters on June 16. Paisley’s 2017 Weekend Warrior World Tour kicked off on May 18 and continued across the country after returning from sold out shows in Sweden and Norway this summer. Paisley has partnered with Sarah Cannon, the Cancer Institute of HCA Healthcare, and Sony Music Nashville, by launching 2017 Band Against Cancer. The campaign will spread the word of community-based treatment, options and support. Sarah Cannon has adopted Paisley’s #1 hit “Today” as the campaign’s 2017 theme song. Paisley’s Netflix comedy special debuted August 15 – “Brad Paisley’s Comedy Rodeo.” He has a song, “Stubborn Angels,” in the upcoming movie Same Kind of Different As Me, in theaters October 20. Paisley will return for his 10th year as co-host, with Carrie Underwood, for “The 51st Annual CMA Awards,” airing live on Nov. 8 (8:00 – 11:00pm/et) on the ABC Television Network. Paisley has partnered with Boot Barn® and developed an exclusive line of jeans, hats, T-shirts, jewelry, belts and woven shirts called Moonshine Spirit by Brad Paisley. Connect with Brad at www.BradPaisley.com, www.Facebook.com/BradPaisley, on Twitter @BradPaisley, on Instagram @Brad Paisley, and YouTube at YouTube.com/BradPaisley. Country Music News Blog participates in advertising programs that help fund the operation of this site. For more information please visit our privacy statement. This entry was posted in Brad Paisley, New Music, Press Releases, Videos by Shauna "WhiskeyChick" Castorena. Bookmark the permalink.